Borders are always interesting places. As someone who grew up on an island where a land border meant waiting for the first signs of ARAF painted on the tarmac as we left Cheshire for North Wales, the idea of crossing from one country to another by car or, even better, by foot remains a fascinating proposition. 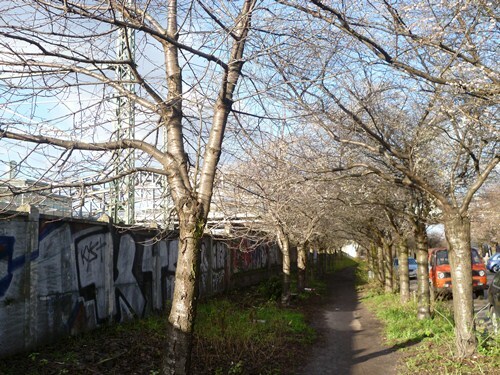 For the urban wanderer borders are also the location for much that is worth discovering, whether it is the border between neighbourhoods, between the inner city and suburbia, or the edgelands that mark the often muddled and blurred boundary between the urban and its hinterland. In Berlin of course we have a structure – or for the most part the memory of a structure – that if you follow its 160 kilometre length will offer up all of the above, as well as the reminder that once where Wedding becomes Prenzlauer Berg or Mitte becomes Kreuzberg was not just the matter of crossing a street from one neighbourhood to the next, but an international border guarded by concrete slabs, barbed wire, and guards with guns. 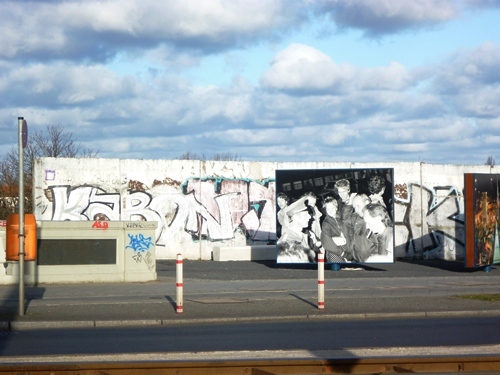 The Berlin Wall itself is almost entirely gone. 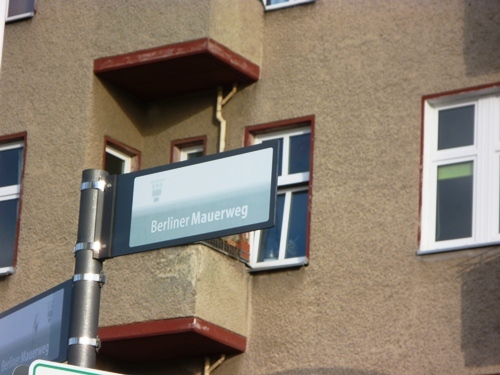 There are a few stretches here and there, such as at the Documentation Centre on Bernauer Straße or the famous kilometre of open-air artwork that is the East Side Gallery. 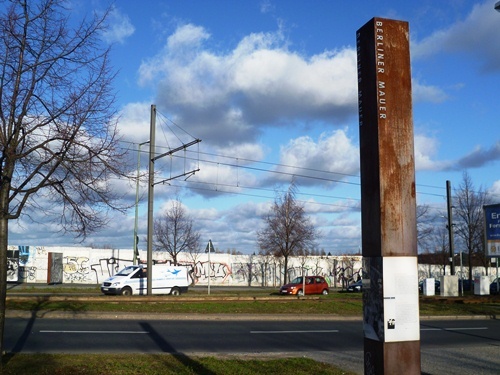 But for most of its route, the Berlin Wall is marked by little more than a line of cobblestones laid in the ground and the signposts for the Berlin Wall Trail which will take you around its route. The trail takes you through the heart of the city, right past the Brandenburg Gate and the Reichstag, within striking distance of the main train station and through the grass and concrete jungle around Potsdamer Platz. It also takes you past the unlovely housing blocks (both east and west) of the suburbs, alongside the garden colonies and allotments that once snuggled up to one of world politics’ most symbolic flashpoints – the literal manifestation of Churchill’s Iron Curtain… For over a hundred kilometres of its length the Wall separated not two sides of the city, but the Western districts of Berlin with the surrounding Brandenburg countryside, cutting lakes in two and blocking the once highly prized views of the landscape at the bottom of villa gardens that once belonged to millionaires. I have walked a number of stretches of the wall trail, from the one that runs close to my apartment and takes me from Bernauer Straße, where the first checkpoint was opened in 1989, into the heart of the city, to a picturesque walk along the lake at Wannsee, where you share the forest footpath with cyclists, joggers, and kids with their ice creams before you turn and corner and find yourself outside the gates of the villa where the Nazis formalised plans for the Final Solution. I imagine that to walk the Berlin Wall trail in its entirety would be to give you a sense of almost every aspect of this city, as it is now and as it has been in its past. At a good pace you could do it in eight or nine days, perhaps circling the city from the north round to the south before coming up the giant new airport at Schönefeld and making the plunge into towards the television tower forever blinking on the horizon. This entry was posted in Memory, Places, Walks on March 12, 2012 by Paul Scraton.